Effective 28 December 2018, you will get one gold coin worth USD38.88 for every USD100 spent on merchandize only (shipping cost not included) on a SINGLE RECEIPT on a single day. Eg. 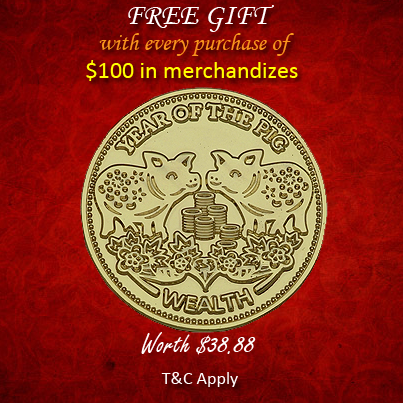 if your total merchandizes amount to USD500, you get 5 coins for free. Receipts cannot be combined. While stock lasts, so please order now before the stocks are gone! This free gift can be subjected to changes at any point of time. For those who are interested in buying the coin directly from us, you may find out more details of the coin here.